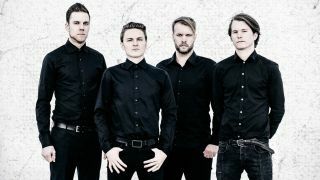 Leprous have announced that their fifth album will be released later this year. The follow-up to 2015’s The Congregation will be titled Malina – and it will launch on August 25. Frontman and keyboardist Einar Solberg says: “This album is the perfect example of how you can start with a vision and end up with a result that has nothing to do with the original idea. “The writing of the album started out with the idea to perfect the sound and working method we began with on The Congregation. While the writing process was actually pretty similar, we gradually started noticing stuff with the sound and the songwriting on the previous album that we wanted to sound different. Leprous recorded Malina with David Castillo at Ghostward Studios in Sweden, while mixing was carried out by Jens Bogren. Solberg continues: “David immediately understood where we wanted to go. We spent probably four times as many days in the studio as with any other recording we’ve done. We’ve come to learn that if you want to sound unique that is primarily done during recordings, not the mix. He adds: “We feel with Malina that we’ve managed to achieve a natural sounding organic album with great songs that still sounds modern. Leprous have also announced a 24-date European tour which will follow Malina’s release. They’ll be joined by special guests Agent Fresco, while Alithia and Astrosaur will support. Tickets go on sale tomorrow (May 19) at 10am local time. A full tracklist for Malina will be revealed in due course, while a full list of the band’s tour dates and can be found below along with the album’s cover art.